Emergency hair color correction is exactly that. . .an EMERGENCY! You can’t go to work. You can’t sleep. Your husband or boyfriend doesn’t appreciate that new shade you chose. What to do?!!! Lighteners that turn orange or brassy. Hair that’s turned almost black. Hair that’s too bright at the scalp and too dark at the ends. Hair that’s dark in the middle and ends. Hair that’s blotchy and unevenly covered. Hair that’s damaged and breaking at the ends. high potential for an even greater catastrophe if you try to fix the problem on your own. 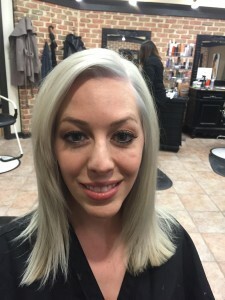 A trained technician who understands chemistry and color theory can handle the multiple steps required to remove or lift old hair color and add back the combination of base hair colors to achieve the shade you want. 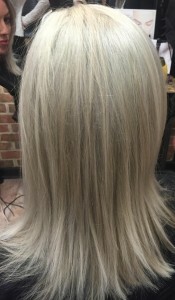 More importantly, a colorist can get you the results you want with little or no additional hair damage. 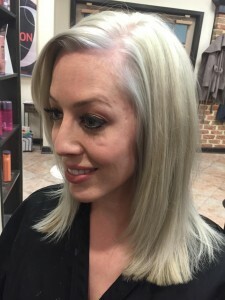 You can rely on Indulge Salon to solve your box color fiasco by toning it down, by adding highlights to soften the look, or simply getting rid of the entire color – properly. If the hair is not damaged from too much lightening, we can remove the color you put on with the right product removers. 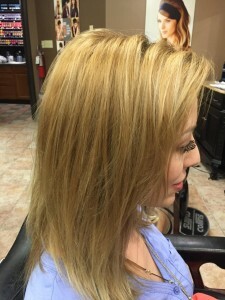 We then prep the hair to fill in any damaged areas and give you the color you originally were going for. It is critical that you tell us exactly what was used that caused your color emergency, so we can make a proper evaluation, fully outline your options, and give you an estimate. If, for example, you used a fabric dye that comes in a box – that cannot be chemically lightened so we can apply a moisturizing color to tone down the hair and eliminate the undesired shade. We recommend a color visit every four weeks until the undesired color grows out. When color turns “almost black” the culprit could be the water (high mineral content), the medication or vitamins you are taking, even stress (which can affect hair thickness for up to three years). Whatever goes into your body comes out through the hair follicles and sebaceous oils. Liver medication, for example, can instantly turn blonde hair black, even if you are putting a blonde shade on blonde hair. We strongly recommend avoiding home box color. Even when you followed box directions to the letter, so many things can go wrong it’s positively scary. Applying color is also a challenge. You can’t see the back of your head. Different sections of the hair can absorb color differently due to hair texture, strength and porosity. And even if your hair is finally growing out healthy at the scalp the ends are still carrying your previous challenge. If you are not sure about your hair and what to do about it, then call us or check the location nearest you on our Locations page. If you are blonde and want to go darker this does not mean buying a color and just putting it on like you see these do it yourself’ers. I mean seriously, we went to school and advanced trainings for a reason which is to fix hair color and to make you look your absolute best in the shade that suits your skin. 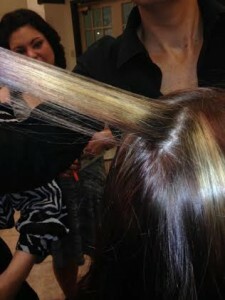 As you go darker the hair will need to have some hair color pigments that are missing be placed back into the hair. Think about it this way, if you bring some friends over the house and lets say they are the red friends and you also invite some blue friends over but you already had some yellow friends at the party. Next, some of your red friends will stay if you place them in the hair first, then the other friends may stay longer. (friends are pigment dyes) We have to keep all of our color friends as long as possible. 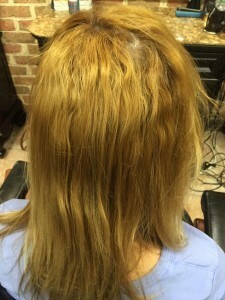 This is why when stylists and hair colorists talk about filling the hair, we have to prep the hair as much as possible to prepare a path for the real color to be placed on the hair after filling it so that it stays longer. I hope that makes sense to you. Otherwise, the hair color that you place on the hair will leave and wash out much quicker than what you wanted I’m sure. The same scenario goes for darker hair going lighter. We have to remove the darker pigments and allow the lighter ones to shine through. This can take several minutes to several hours. Don’t be surprised if you are asked to bring a book and we discuss the options of taking your hair lighter for a blonde result. 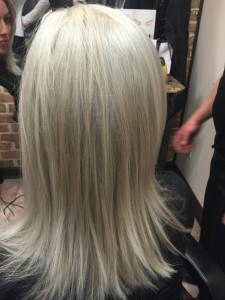 Then after using a lightener product to achieve the perfect lightness, then we have to apply a special toner or color balance that places pigment back into the hair for the desired color. A desired toned color which is usually a softer pastel shade that enhances the skin tone. 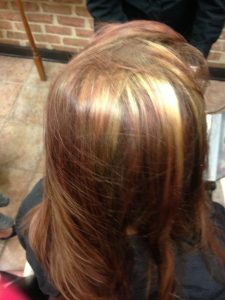 So you see, hair color correction comes in all forms that we are called upon to fix. My favorites are the college students that are trying to do each other’s hair and are left with the bright orange hair and come walking in with hat to cover the adventure in hair in the dorm. We recommend to call us right away and we will fit you in to fix it. 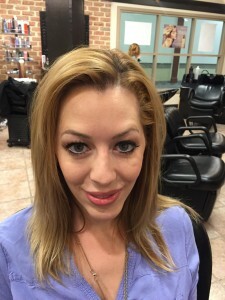 Also part of hair color correction is asking many questions that are relative to your health such as medications, well water which is tough on the hair and can prevent the best penetration of the dye molecules into the hair. What you eat has a significant influence on your hair. We recommend lots of green vegetables and fruits to give you hair the sources of minerals and vitamins that you need to keep your hair at its peek health. For best results let Indulge handle your hair color needs. We listen to what you want, work with you to find the color mixture that reflects and defines your beauty, and provide the right protein and moisturizing products so you can maintain the look at home – consistently. Click here to see our signature colors.